Some of you may have seen this over on Threadbanger, or maybe I've shown it to you myself, (or maybe, if you're one lucky girl who probably isn't even reading this, you own it! ), but I'm posting it here anyway. 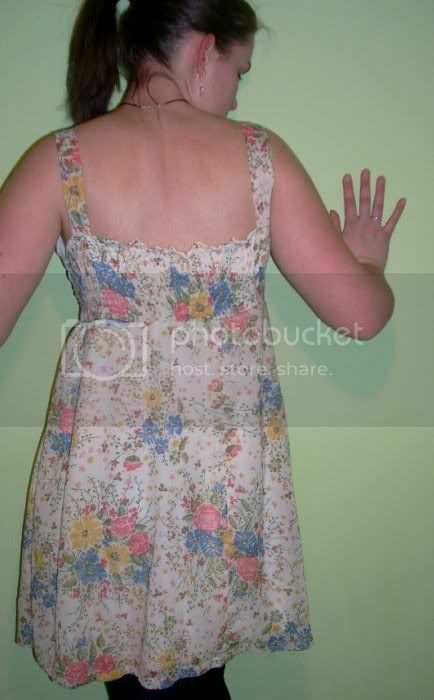 It's a sheer floral fabric with a white underlay. It had potential. Lots of potential! I used the skirt and the elastic-ruched panels of the old dress to make a new one! The elastic is in back because I had to make the fit semi-variable as this was a gift. 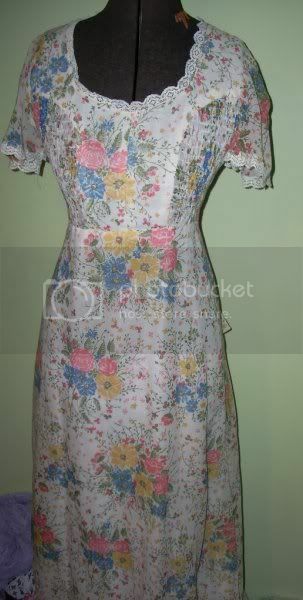 It has a crossover bust, and a little built in belt in front, with knife pleats in the skirt. It is so perfect for summer! And it's a fantastic show of recycling. Reconstructing is terribly satisfying, especially if you remember to take "before" pictures. In other news... I have been here for over a year now! 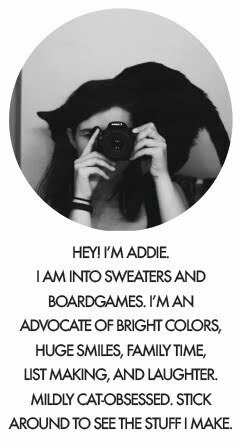 Actually, a year and a week ago I posted my very first, very dull, introductory post. (Don't go back and read it. Instead read this post, or this one--there is more, hm, substance to them.) I like to think that my style has evolved in this last year, and I know my skills certainly have. However, there is a part of me that is nostalgic, almost, for last winter. It was a time when everything was new and exciting. I had just gotten my serger. I had the joy of constantly discovering new ways of doing things, new inspiration. It was rather like being a kid in a candy store. The best way to keep the "mojo" flowing is to have a clean, organized workspace. With some help from Mom, and thanks to some outlet wiring from Papa, I have an incredible re-organized, clean sewing room. Pictures will be forthcoming, as soon as I finish everything in it. But I finally have enough space for my fabrics, believe it or not! My sewing machine and serger are set up in an L-shape, for quick and easy switching between machines, and I even have a comfy desk chair that I can wheel around in. It's so exciting. I haven't actually set to work in there yet, but surely tomorrow I'll make the time to. Wow. :) The Granny dress is horrible, but you made a work of art out of it! It kinda reminds me of what God does for us! We are rags and very ugly dresses in our sin, and God comes along and picks us up and can change us into a new creation! Is that not cool or what? Anyway, we need to talk soon, I have a funny story for you! Great job on the dress, and happy blogging anniversary! I love your recreation. It is beautiful. I'm glad you have such a nice workspace. I know once we dedicated a space to my embroidery it made a world of difference. I just finished cleaning my office last week. I can't wait to see pics of your sewing room! Hey...I've been slacking on my blog reading, but I dropped by to see your latest projects. 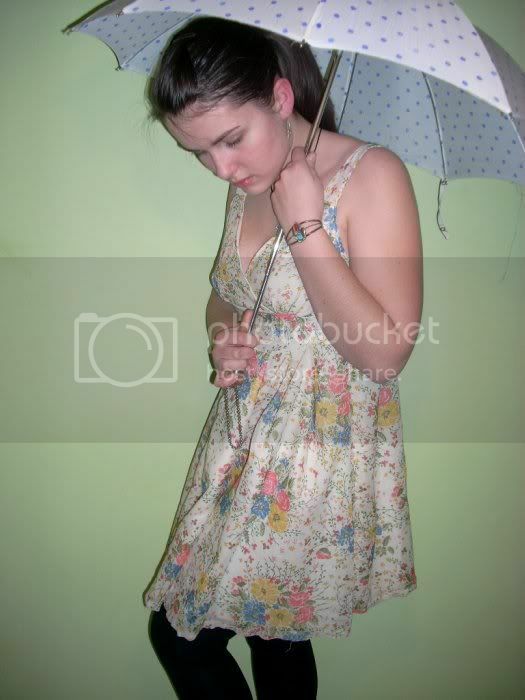 I love that dress recon, it looks so adorable...and the photo with the umbrella is cute. I also really like the wallet in the post below. How did you make it? For the cassette wallet, I mostly just figured mine out through trial-and-error, but I can direct you to a couple of places that really helped me out. It's a lot different from mine, though. I figured out how to make mine mostly by studying the pictures from here: http://www.etsy.com/shop_sold.php?user_id=5615103.